Dave Rutz came out of retirement to rejoin the department as Director of Sport Fish in January 2019. 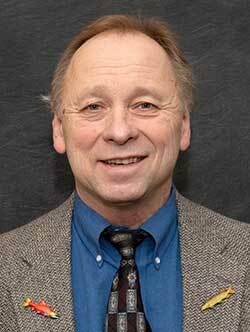 He brings nearly 40 years of experience in fisheries research and management to his new position. In his former role as area management biologist, Rutz spent much of his career at the department's Sport Fish division in the Northern and Western Cook Inlet Management area. He has also led the department's Alexander Creek Invasive Northern Pike Removal and Restoration project and has worked around the state in various research and management roles. Rutzs' love of the outdoors brought him to the wildlife management field. He graduated with a B.S., Wildlife Fisheries Emphasis at St. Cloud State in Minnesota in 1980. He is a Vietnam-era veteran and served in the U.S. Army from June of 1973 to June of 1977. He is an avid big and small game hunter and sport fishing enthusiast. He also participates in personal use and, occasionally, subsistence fisheries. He has been married to his wife Meg for 31 years. They have two children, Joe, who recently graduated from the University of Alaska Anchorage with a journalism degree and Sara who was recently accepted into medical school. "I enjoy all aspects of this position," he said. " Not only the field work but the challenging aspects of providing for and protecting fisheries resources for current and future generations of Alaskans who engage in sport, personal use and subsistence fisheries."